This is the second edition of what was formerly known as Frommer's Unofficial Guide to the Best RV & Tent Campgrounds in the U.S.A. While the basic format has been retained, the number of campgrounds evaluated has been nearly doubled. The directory includes listings for every US state except for Hawaii and also includes information for British Columbia in Canada. Another useful feature of this new version is an expanded list of campgrounds in each state that the editors were unable to review. Although the listings in this expanded list do not contain the all-important qualitative reviews described in Nancy Kieffer's review (below) the basic facts regarding number of sites, availability of utilities, and contact information is provided. The index has been completely redone, and all of the campgrounds (whether on the reviewed list or not) are listed alphabetically by state. This edition was published in April, 2004. The directory itself is very easy on the eye with a pleasing layout, lots of white space, and no clutter or ads. Each listing is organized with name, address, phone/fax numbers, and Web site address highlighted at the top. Next is the review, which in turn is followed by four paragraphs titled "Basics," "Facilities," "Restrictions," and "To Get There." 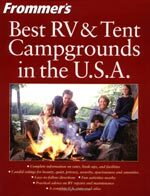 In addition to state maps, a comprehensive index, and a page highlighting the main attractions in each state, there is nice section showing campground awards by state, with sixteen award categories including "Most Romantic," "Most Private," "Most Secure," and "Best Family Campsites." This would be the only directory I would ever need or want, except for its two drawbacks. First, there are only 2,500 listings as compared with 17,000 plus for Woodall's and 14,500 for Trailer Life. Hopefully, Frommer's will, over time, visit and review many more places. Secondly, there is no CD or online version, and the directory itself must weight at least 5 pounds.